I’ve played more than my fair share of NHL 17 over the past couple weeks, and I’ve been spending a lot of time in Hockey Ultimate Team. It’s an area of the series that has undergone somewhat of an overhaul this year, with a few key changes to note. I’m going to take this chance to go a little more in-depth with my thoughts on this addictive pastime. The most notable change is that last year’s chemistry system has been replaced by something called Synergy. It works in one of two ways. Firstly, player synergies only affect players who share the same trait — Dirty Dangler, for example. Once you’ve got enough players on your team to activate that synergy, they will all benefit from a boost to their stats. Team synergies work in exactly the same way, but once they are activated, the entire team gets a boost regardless of what traits they employ. I’m still not sure how I feel about the new structure. It gives you more freedom than the chemistry system of old, but I actually quite liked the restrictions that were placed on teams in previous iterations. It’s not a bad addition, but synergy hasn’t yet grasped my attention in the way I’d hoped it might. I really like this feature. Anyone who has dipped into the NHL series in recent years will have surely come across HUT collections, which was the old way of doing things. It rewarded you for acquiring full teams of players via the marketplace or through packs, and the rewards were legitimately worth the hassle. Now, sets has taken that concept and pushed it to the next level. It’s much more prominent of a feature, and you’re actively encouraged to trade-in everything from players to arenas for lucrative rewards. Also, if you’re missing a few key cards, you can search for them individually via the well implemented “my collection” feature. Giving this area of the series the attention it deserved will undoubtedly extend the lifespan of this year’s game for many. Draft Champions makes its debut in this year’s game, and it’s heavily incorporated into Ultimate Team. 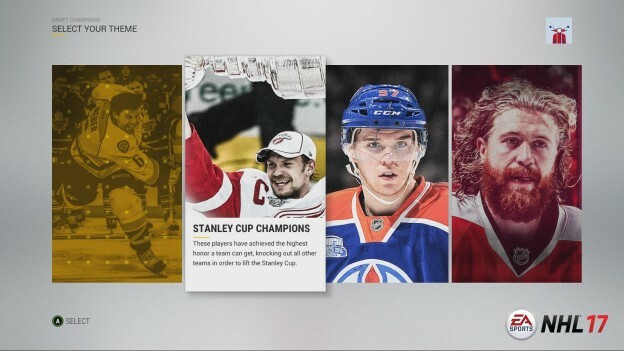 If you’ve played Draft Champions in another EA Sports series in the past, you’ll find it has been similarly implemented here. Simply put, it gives you the ability to undergo a fantasy draft, taking a team of players into a four-game stretch either online or offline. Once you’re done, you’re rewarded with packs that can be transferred to an exclusive section of the new HUT sets feature. It’s that last bit that makes Draft Champions worth the effort. There’s a lot of potential to come away with some big rewards if you’re willing to put the time in. The only minor downside to my Ultimate Team experience so far has been the slow menus. It’s something the NHL series has yet to master on the current generation of consoles, and it particularly stands out here. It stands to reason this would stand out because you’re constantly switching between different screens as you open packs, put items into sets, re-arrange your team and much more. Occasionally, it’s such an annoyance that it puts me off playing HUT altogether. I’ll get through a few games with no issues, but then the prospect of trudging through sluggish menu screens to acquire new players and consumables is a tiresome one. In actuality, the loading times aren’t that bad, but they stick out like a sore thumb when compared to some other sports games. I don’t want to end on a sour note, however. 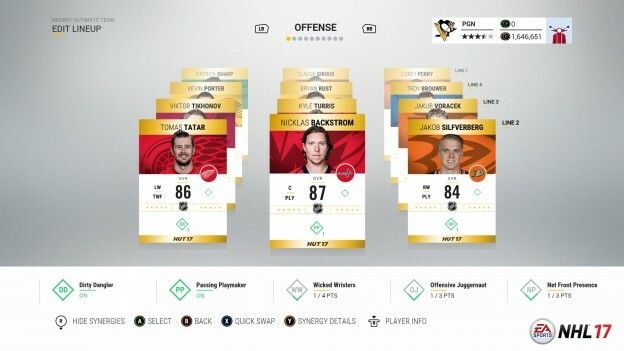 I’m largely impressed with this year’s improvements to Hockey Ultimate Team, and I’m a particularly big fan of dynamic HUT sets, which will undoubtedly keep me invested for the long haul. What are your thoughts on HUT in NHL 17? Are you happy with the new improvements?